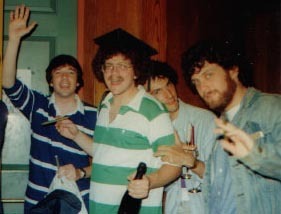 Here it is, the photo you've been waiting for: Gersh, holding champagne bottle, surrounded by his college buddies. Is that a mortarboard on my head or just bad hair? And how about this classic hairstyle (below)? Look, it was 1988. Bite me.